I would just like to say thank again for teaching me and making it so easy for me to pass my test. My dad has now brought me a car, a VW polo so I can now go out on my own. I have recommend you to my friends thank you so much for everything you have done. Passed first time - with only 25 hours of lessons! Learning to drive with Sheila has been nothing but a pleasure! After having a couple of lessons at the age of 17, I decided driving was too scary and put a stop to it. 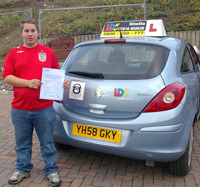 8 years later, stood in the pouring rain, I thought to myself, I need to start driving lessons again and get a car! After searching for many instructors online, I decided on Sheila purely based on her professional and approachable attitude in her own description. This turned out to be the best choice I'd ever made! I had my test booked already, before contacting Sheila, and in a panic I explained what I needed to do with only 3 weeks to do it! Sheila was great every step of the way. Took me from barely being able to move a car to test standard within ONLY 3 weeks! Resulting in a FIRST time pass! Throughout my lessons I used to get angry with myself for making mistakes and often upset. Shiela would always calm me down, explain everything in clear detail and made my low confidence bloom in such a short time. Sheila's professional and friendly attitude helped me overcome a fear of driving and has now replaced that fear with enjoyment. Learning to drive with Sheila was one of the best decisions I've ever made. I could not have done it without her saint-like patience, encouragement and passion for what she does best; Teaching to drive! I want to say a BIG thank you to Sheila for being there for me, guiding me every step of the way and most of all, for empowering me to change my life for the better. I couldn't have done this without Sheila and will always be very grateful. My message to anyone out there who's looking to pass their test, whether one hour a week, a crash course and especially for the nervous drivers, like myself, Sheila is definitely your first choice! I took an intensive course with sheila i found her very friendly which made me at ease. She was very patient and explained every thing very well and understandable. At the end of the week she had made me feel like i was ready for my test which i took and passed first time. Thanks sheila i would recommend to anybody. This is just a few words of appreciation for my driving instructor Sheila. I've never drove before and she taught me everything from beginning. On my lessons she was always very patient and understanding. 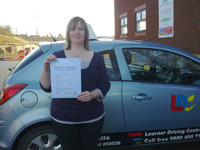 Sheila helped me with my confidence on the road and i passed my driving test first time. 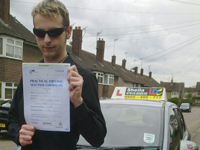 If you want to pass your test as painlessly as possible the please read on. After a couple of bad experiences with driving instructors I was feeling in despair of finding one who would get me through my test. Luckily, I found Sheila. I was a very nervous pupil but Sheila wasn't put off by this at all. From my first lesson with her she was very calm and patient and gradually over the weeks my confidence grew. If you make a mistake, don't worry. Sheila will tell you the correct way to do it, without judgement or censure. She won't raise her voice or make you feel a fool. She has a very effective way of teaching manoeuvres. In fact, once you go through manoeuvres with Sheila, you'll wonder why you worried so much in the first place, and she'll find the method which works for you. Gradually, you'll become a driver, and you'll look forward to your lessons. I can honestly say that was a novel experience for me because I had never before looked forward to lessons with other instructors. I passed my driving test first time and can say without doubt it's testament to Sheila's teaching ability and I can't thank her enough.